Recognize safety achievements in your organization with safety awards from Terryberry. With the experience and resources to help you at any stage, we can assist with program design and goal-setting, award selection, promotion, and fulfillment. Our goal is to help you succeed. There is no higher concern at your organization than employee safety and well-being. In addition to your concern for individual employees’ health and safety, the level of safety of your workplace affects every aspect of your business, including productivity, ROI and retention. Especially if your industry involves hazards, when your employees go above and beyond to adhere to standards, watch out for one another or suggest improvements to procedures to reduce accidents, this can go a long way to making your company a better place to work. Use safety awards to show your appreciation for those employees who are making a difference. Choose from a variety of products and online programs to implement your safety awards program right away. Engraved awards offer a permanent display to commemorate a safety achievement. Safety award jewelry is a distinctive choice for top safety achievements. Safety award rings, watches, safety recognition pins and more can be customized with a logo, name and the safety initiative or milestone. Award Presentation kits include a certificate and a logo gift. AwardPoints is an online points-based sales recognition program for ongoing motivation. 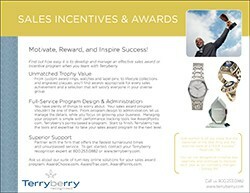 Participants earn points as they reach safety goals, and they can redeem points for rewards from Terryberry’s large catalog of brand name gifts. – Leanne, Widex Canada Ltd.
No matter what your safety awards needs, Terryberry’s award consultants can help you implement a safety recognition program that help you achieve your safety goals. Contact us to discuss your needs or to get ideas.